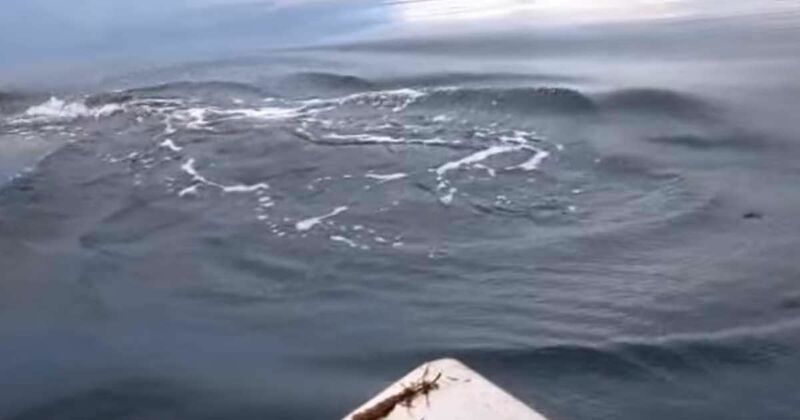 What started as a leisurely day of crabbing for three friends took a surprising turn and set their hearts pounding as they encountered something a lot bigger—and scarier!—than crabs. The three young men—Steven Sloan, Michael Niccum and Eugene Dight—were checking their crab pots on a nice day off the west coast of Anderson Island. While they were pulling up the traps, the rope dragged across the side of the aluminum rowboat. 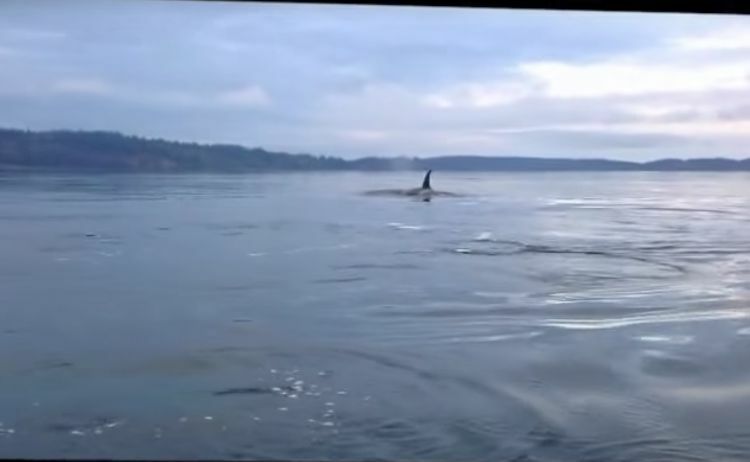 Apparently, the noise caught the attention of at some young Orca whales. At first, the men are entranced by the sight of the whales breaching, followed by their playful lob-tailing as they slap their tails against the water. They are about 50 yards away at that point. But then the whales begin swimming directly toward the little boat, and the men get concerned. As soon as Steven notices that the whales are significantly closer, his excitement mixes with the adrenaline rush of fear. What will baby whales do to their tiny craft? He tells his buddies it might be time they head for shore. The whales are getting closer, and they are definitely moving faster than the boys in the boat are. Steven’s voice goes up a notch, adding to the anxious sounds of his crabbing buddies. Those orcas are heading straight for them! 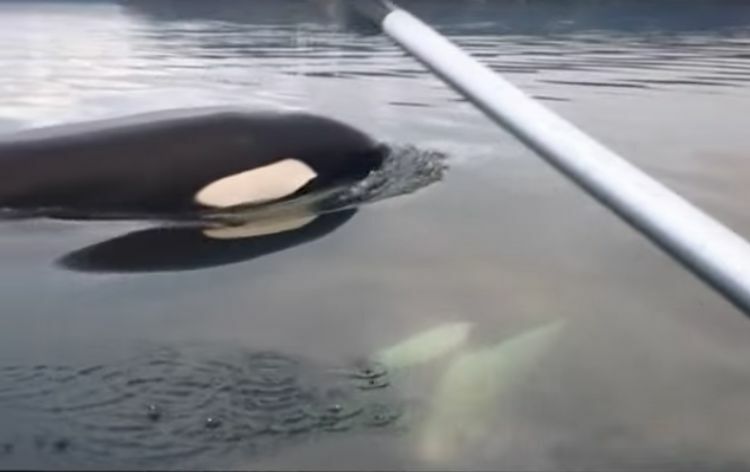 Now the young men see that the orcas do, indeed, seem to be coming to check out the little boat filled with three excited but anxious friends. There’s no way they can avoid meeting the baby whales up close. But what will they do? “AARRGHH!” Frenzied voices call out to one another as the first whale shows just its dorsal fin as it approaches. Oh, my, is it close now! 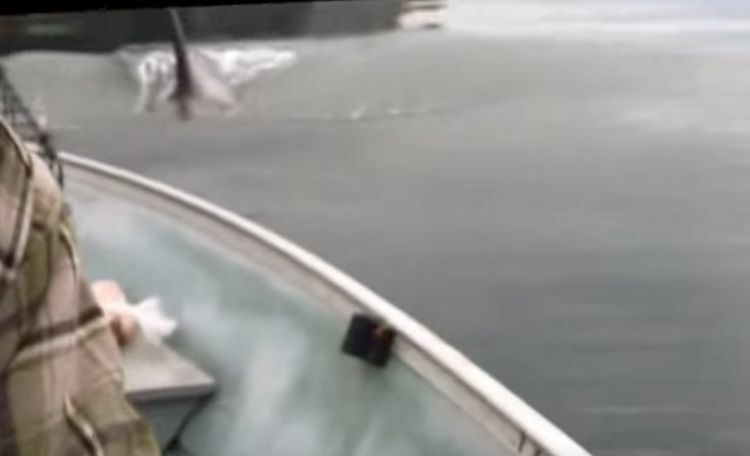 After swimming right beneath the boat, the young orca surfaces just in front of the boat’s bow. 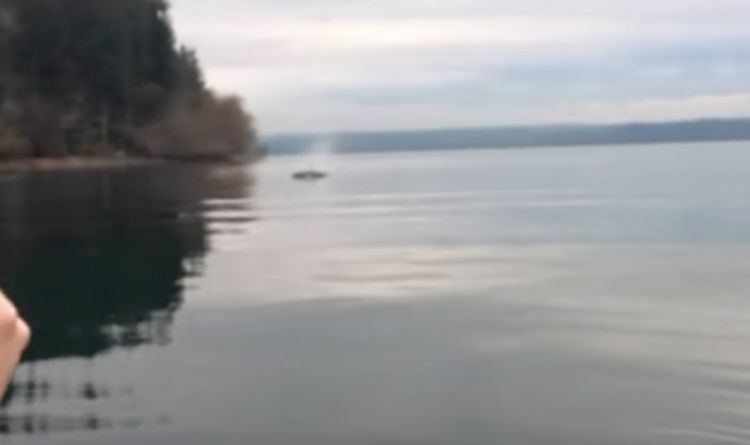 Although the whale didn’t touch it, it was eerie knowing an animal even bigger than the rowboat has just passed right underneath it. 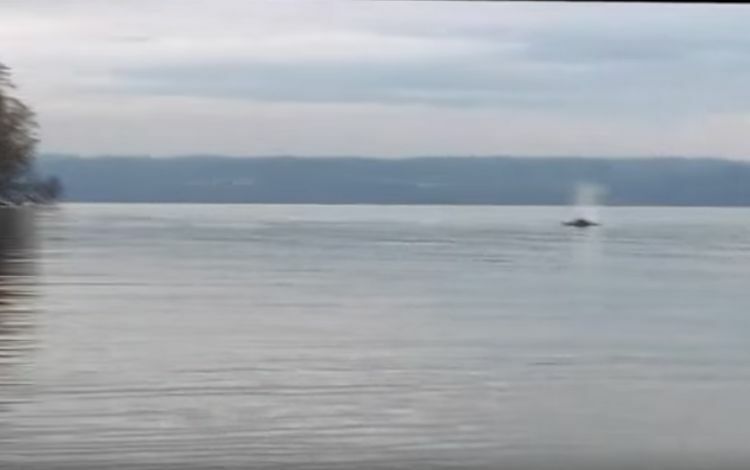 Now both whales can be seen, as one surfaces and one stays down in the water. They seem satisfied with their cursory investigation and begin swimming away. 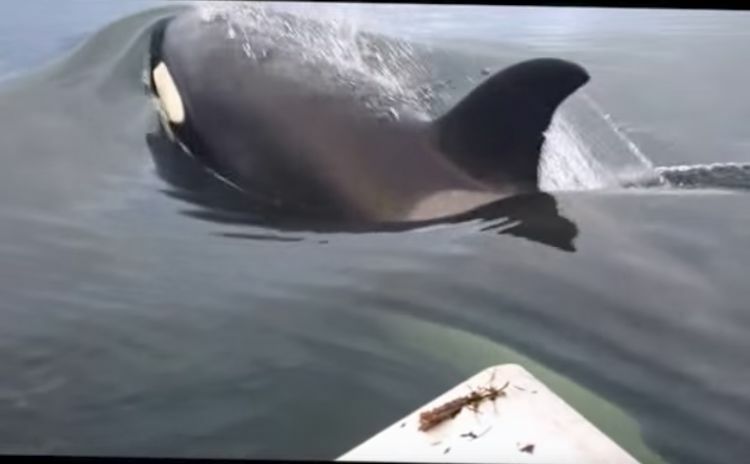 The young men are awed by their unexpected encounter with the magnificent creatures, and now that it is clear the whales mean no harm, they are amazed but no longer afraid. 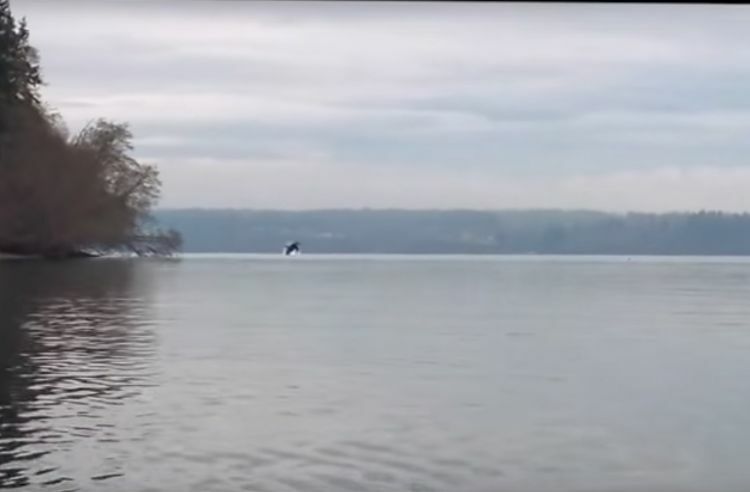 As if in farewell, one of the orcas surfaces again on its way back out into deeper water. The excitement may be over for now, but it is surely one experience the three friends won’t soon forget. As you watch the video, you’ll be caught up in their range of emotions, and may even feel a little sad when the beautiful creatures swim away. I know I was! Pinkie, an aptly named pink dolphin, is getting serious attention. She lives in a lake and her striking appearance is hard to miss.